Valentine's PEANUT BUTTER CUP BARS! WHO CAN SAY NO TO A PEANUT BUTTER CUP? I CAN'T! And Valentines' day is THE PERFECT EXCUSE to eat them. 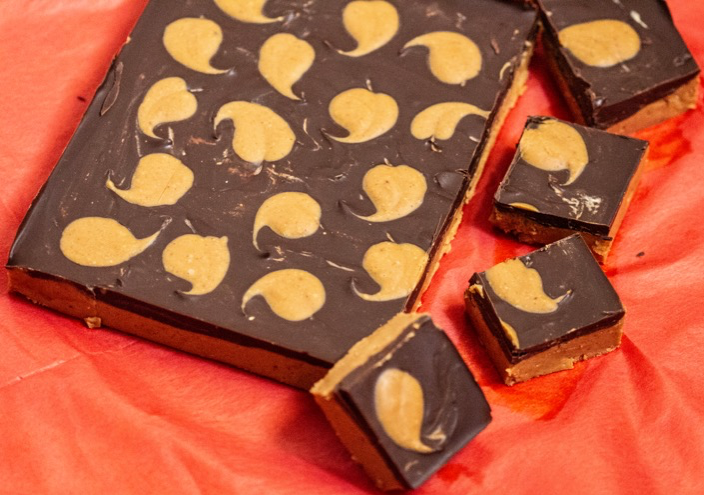 These peanut butter cup bars become EVEN MORE IRRESISTIBLE WHEN THEY'RE HOMEMADE. Making them yourself allows you to choose your chocolate-- milk or dark? and your peanut butter-- smooth or crunchy? But any way you slice them, they're gonna be yummy. And since THEY'RE NO-BAKE, they're easy as well "pie." All that's needed is a chill in the fridge and they're ready to go. I've used my famous peanut butter truffle filling for the base. And then topped them with a layer of smooth, melted chocolate. The recipe is mine but the inspiration and optional heart decorations are from Martha Stewart's version, which make these bars so pretty for your Valentine. This "loved" confection is a no-bake treat for any time of the year, but YOUR VALENTINE WILL FEEL ESPECIALLY LOVED WHEN THEY RECEIVE A BOX OF THESE on February 14th. 1. I use Smucker's natural smooth peanut butter, but you can choose any brand you like. Just don't use freshly ground, which will get too greasy. 2. I melt the butter/chocolate mixture in a heavy saucepan over very low heat. And, I stand over the pot, stirring constantly 'til smooth so it doesn't burn. But you can also more safely melt it in bowl placed over, but not touching, a pan of simmering water. Just make sure not to get any water in the melted chocolate. 3. Don't forego the parchment "handles." You will need to be a little patient, but it's the best way to get the uncut bars out of the pan. 4. If you don't want to make the hearts on the top, decorate with any heart candies you like, or just keep them pure and unadulterated. Spray the bottom and sides of an 8-inch-square baking pan with cooking spray. Cut a piece of parchment that lines the bottom and goes up over the sides leaving a 2 inch overhang. In a medium size saucepan, over medium low heat, melt the butter. Stir in the peanut butter until smooth. Remove from the heat, and stir in the confectioners' sugar, vanilla and salt, until well combined and smooth. Evenly spoon the mixture in the pan, and with a spoon or an offset spatula, spread it evenly and smooth the top. In a medium heavy bottomed saucepan over medium heat, melt the butter. Turn the heat down to low, add the chocolate and continually stir until smooth. Remove and cool for a 2-3 minutes. Alternatively, fill a medium size saucepan with 2 inches of water and bring to a simmer. Combine the chocolate and the butter in a metal bowl that can fit over the saucepan without touching the water. Stir the mixture until the chocolate has melted and mixture is smooth. Remove bowl from heat and let cool slightly, about 3 minutes. Gently stir the chocolate, and pour it evenly over peanut-butter mixture. Using a spoon or off set spatula, smooth the chocolate evenly across the top. In a small bowl, stir together the softened butter and peanut butter until smooth. Drop 1/4-to-1/2 teaspoon rounds of the mixture on top of the chocolate layer in 1-inch intervals. Starting about an 1/2 inch above the peanut butter round, drag the tip of a wooden skewer or toothpick quickly through center of each round and then off to one side to create a heart shape. Refrigerate until firm, at least 4 hours. Run a paring knife along the edges of the pan on the two sides not lined with the parchment. Use the parchment overhangs as handles to gently lift the bars from the pan. It may take a little gentle nudging to loosen it. With a large sharp knife cut into 1 1/2 to 2 inch bars, wiping the knife clean after each cut. Store the bars in the fridge until ready to serve. They will stay covered in the fridge for up to 2 weeks.